Save the date for this immersive, one-day boot camp that provides critical training for current and prospective nonprofit board members with dynamic speakers, core programming, and advanced elective options. 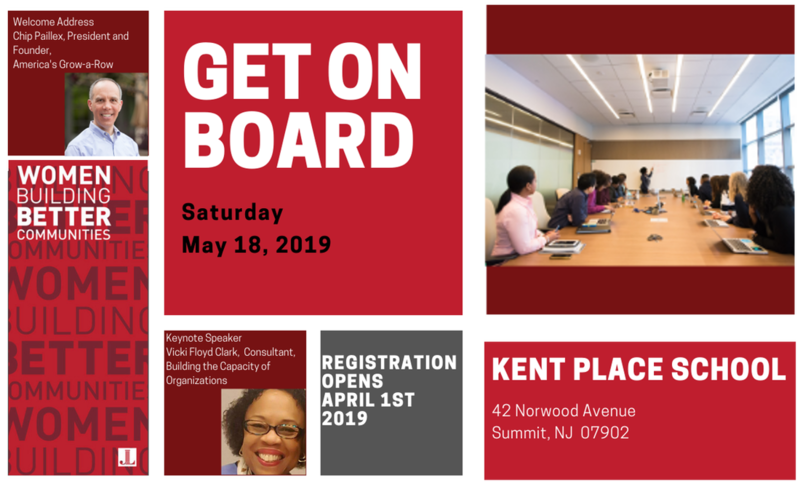 Launched in 2016, Get On Board is an annual, one-day, immersive bootcamp custom-designed to provide attendees with the essential skills to enable them to be effective and meaningful members of a nonprofit board. The curriculum is designed to provide introductory information for new or potential board members, as well as include more advanced electives and workshops for more seasoned members so they may hone in on relevant trends and changes in the ever-changing nonprofit world. The Get On Board program is designed to launch trained volunteers into the community to allow them to provide the broadest and best impact through service across a spectrum of nonprofit organizations throughout the state of New Jersey. The Get On Board matching program helps to facilitate trained individuals with nonprofit organizations throughout New Jersey. Created and pioneered by the State Council of the Junior Leagues of New Jersey, the curriculum was developed to create a pipeline of well-trained current and prospective board members, both inside and outside of the Junior League community. A voluntary matching program to help graduates of the program find nonprofits in need of trustees and volunteers is now underway. Since Get On Board launched in 2016, the State Council of Junior Leagues has trained over 250 individuals, many of whom are looking to help organizations. ​The New Jersey Junior Leagues have a rich history, with many of our organizations having served our local communities for more than 90 years. Members of the Association of Junior Leagues International, Inc., the New Jersey Junior Leagues embody and exemplify the principles of our mission: to promote voluntarism; to develop the potential of women; and improve our communities through the effective action and leadership of trained volunteers. ​To find out more please email getonboardnj@gmail.com. Get On Board also matches trained volunteers with nonprofits in need of board members. If your organization is looking for trained board members, please click below to share the details.